On route to Abu Dhabi on Sunday, Pope Francis greeted journalists and gave them an icon. 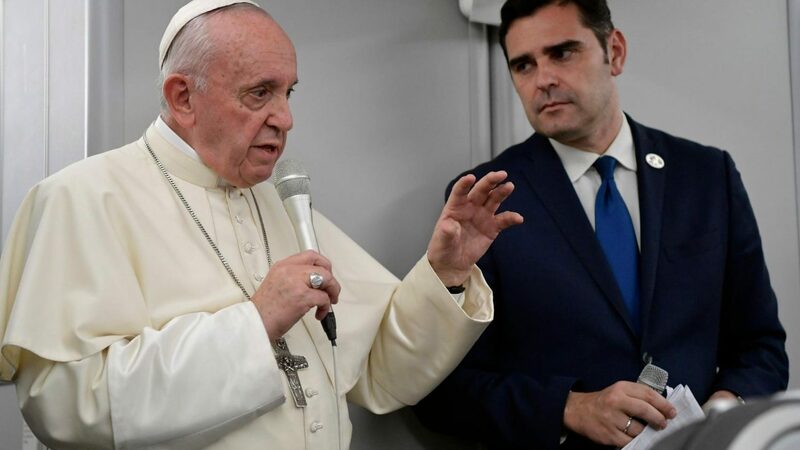 The interim Director of the Holy See Press Office, Alessandro Gisotti, said: “Holy Father, it seems like yesterday - it almost was yesterday - that we were on the flight back from Panama. Among the many welcome posters there was one from the Muslim community of Panama that read: ‘Welcome Pope Francis, man of peace’, in Spanish. It is with this spirit that I believe they await you in the Emirates, as a man of peace, to strengthen dialogue”. The Pope said: “This morning I received news that it was raining in Abu Dhabi, and there it is thought of as a sign of blessing. Let’s hope that everything goes like that”. Pope Francis : “I brought each of you an icon made in the monastery of Bose, a copy, so that you can take it home. It’s on the theme of dialogue between the old and the young. I care deeply about this topic, and I think it’s a challenge”. The icon, distributed to journalists by the Prefect of the Dicastery for Communication, Paolo Ruffini, shows a young monk carrying an elderly monk on his shoulders. Upon his arrival at Fiumicino, airport, the Holy Father visited the structure used for the assistance of homeless people promoted by the Airports of Rome. The structure is part of the project "Lives in transit, the human face of an airport" and provides support to the clochards who station and repair at Fiumicino airport. Launched in 2017, the project sees together, thanks to a memorandum of understanding, Aeroporti di Roma, the Caritas of the Diocese of Porto-Santa Rufina and the Parish of the airport, and allows the homeless of the airport the opportunity to receive assistance .